From prizes, publishing houses and festivals to magazines, journals, writers’ development initiatives, grants and blogs, the contemporary literary scene in Africa is, like those in Europe and in the Americas, reliant on institutions willing to push existing boundaries. While the institutions are doing important work, there aren’t many of them as there should be, and collective progress is slowed by everything from a lack of funding to a multiplicity of options. Nowhere, among initiatives covering the whole continent, is this more evident than in poetry. In 2009, the Babishai-Niwe Poetry Foundation was created by Beverly Nambozo Nsengiyunva, and with it came the Babishai-Niwe Poetry Award, which rewards single poems, which eventually expanded from its focus on Uganda to covering the whole continent. In 2012, British-Nigerian novelist and Brunel University professor Bernardine Evaristo founded the Brunel University International African Poetry Prize, which honours a body of ten poems by an individual poet, beginning a remarkable transformation of our poetry landscape. In 2013, Ghanaian-American poet and Prairie Schooner editor Kwame Dawes founded the Africa Poetry Book Fund (APBF). With an editorial board that includes the Nigerian novelist and poet Chris Abani, the Egyptian poet and professor Matthew Shenoda, the South African poet Gabeba Baderoon, Hampshire College professor Aracelis Girmay, the South African performance artist Phillippa Yaa de Villiers, the American novelist John Keene, and Evaristo, the APBF is a vast initiative. It administers the Glenna Luschei Prize for African Poetry, given for a collection of poetry, and the Sillerman First Book Prize for African Poets, given for an unpublished debut full-length manuscript; and, through its African Poetry Book Series imprint, it publishes the New and Selected/Collected Series, the winners of the Sillerman and Glenna Luschei Prizes, poetry translations from across the continent, and its best-known series, the New-Generation African Poets Chapbook Sets, which invites and publishes promising chapbook manuscripts from poets of African origin. In 2016, Praxis Magazine launched its poetry chapbook series, which receives submissions from new, unknown voices and accompanies their chapbook publication with a response chapbook. In 2017, Brittle Paper launched its Brittle Paper Award for Poetry. 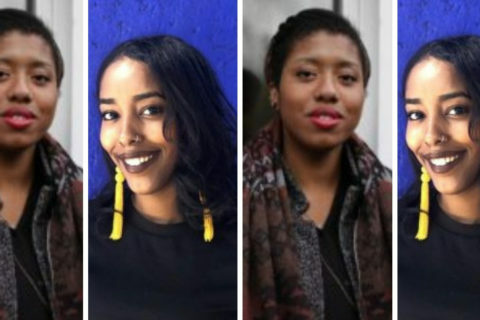 Together, these institutions have announced and promoted new poetry voices—everybody from Warsan Shire, Liyou Libsekal, Safia Elhillo, Nick Makoha, Inua Ellams, Kayo Chingonyi and Gbenga Adesina to Tsitsi Ella Jaji, Romeo Oriogun, Lillian Aujo, Saddiq Dzukogi, Yalie Kamara, Ejiofor Ugwu, Leila Chatti, JK Anowe, and Itiola Jones. It is in this context that 20.35 Africa: An Anthology of Contemporary Poetry arrives. An independent project in the mould of 14: Queer Art, the Afro Anthology Series, and the Art Naija Series, it is the first of its kind to focus only on poetry from across the continent, and it faces newer voices some of whom are yet to enter the orbit of the above institutions, their strong work collected alongside those by better known poets. Two years in the making, 20.35 Africa: An Anthology of Contemporary Poetry is the brainchild of a team of Nigerian poets and creatives: Ebenezer Agu; D. E. Benson; Gbenga Adeoba, finalist for the 2018 Brunel Prize; the visual artist Osinachi; and Chisom Okafor, finalist for the 2018 Brittle Paper Award for Poetry. The anthology, which is guest-edited by Brunel Prize winners Gbenga Adesina and Safia Elhillo, collects verses by 32 poets including Brunel Prize winners Liyou Libsekal and Romeo Oriogun, Brittle Paper Award for Poetry winner JK Anowe, and Winter Tangerine magazine founder Yasmin Belkhyr. 20.35 Africa comes with blurbs by Matthew Shenoda, Rhode Island School of Design professor and a founding editor at Africa Poetry Book Fund (APBF); Mukoma wa Ngugi, Cornell University professor and author of The Rise of the African Novel; and Hope Wabuke, University of Nebraska-Lincoln professor and author of Movement No.1: Trains. In 20.35 Africa: An Anthology of Contemporary Poetry we see the august breadth of an African poetics that dominates the space of intersections; intersections of geography, language, gender, faith. The poems gathered here are insights into the possibilities that take shape when we bridge our cultural specificities with a dedication to craft and aesthetic vision. These poems reach well beyond the continent and her diasporas and into the intimate spaces of every reader who encounters them. The poets here are in love with words and the fractured worlds they live in. The poems are at once sublime yet political, global but rooted and contradiction is the border they call home. The publication of this anthology boldly marks a before and after moment in the African literary tradition and it leaves me feeling humbled, lucky and blessed to be a witness. With poems ranging from interrogations of the nature of borders and the legacies of colonialism to questions of nationhood and ethnicity; reflections on gender and identity to legacies of personal trauma and national violence, the editors of 20.35 Africa: An Anthology of Contemporary Poetry have taken care to select a wide variety of themes and voices that reflect the myriad experiences of young African writers coming of age. The best poetry awakens language to distinct possibilities before unimagined; here, with lyrical language both hauntingly visceral and evocatively imagistic, these young African writers do just that. Here is the editor’s note by Ebenezer Agu. I was an undergraduate when I first noticed the visibility gap between fiction and poetry in contemporary African literature. I’d wondered a lot why, as a student of English and Literature, nothing in my entire course work involved contemporary African poets; all I knew of African poetry at the time were colonial-era and postcolonial works. The concerns of the poets of that era were so quaint they hardly resonated much in me. I wanted voices that investigated issues of my time, voices that may be about the personal or universal but relevant to my understanding of questions of my age. In the second year of undergraduate studies, with a juvenile zeal, eager to fill the void I’d felt with contemporary African poetry, I’d once suggested to a friend that we compile an anthology similar to the Norton anthologies of literature when we graduate. He probably knew the scale of such project—that it would require experience and an involvement larger than just zeal—and he told me so. But the feeling I had then was true, only that it needed to be better understood, which would happen by the time I was done with university. In early 2017, after graduating in the previous year, I was in Nsukka ready to have the first try of an idea I’d carried for some years. I arranged a meeting with two of my poet friends, Chisom Okafor and D. E. Benson, both of whom were as excited about the idea as they were encouraging of it. We drafted the first plan of what would later become 20.35 Africa: An Anthology of Contemporary Poetry, and then contacted Laura Kaminski, Managing Editor at Praxis Magazine Online, and Wale Owoade, Founding Editor at Expound. Both were interested, Laura showed such kind, selfless involvement in the project even though the idea we’d presented to her was full of clumsy plans. She took us straight down the hard way, uncompromising with her truth, which eventually proved phenomenal toward the achievement of the project. It took a year of back-and-forth correspondence with Laura and Wale, working on the project proposal, for us to modify the initial idea we had so that it became worthy of the quality of people we wanted to be part of it. In the last days of December 2017, we contacted Safia Elhillo and Gbenga Adesina to guest-edit the anthology; it didn’t take them more than four days to say yes. Our vision is to annually compile a collection of poets—the relatively unknown, the budding, and the established—between the ages of 20 and 35 years. We are aware that the concept of contemporary poetry could be variegated so we brought it down to age, to publish a specific generation of this wider period in African poetry. We also look to accessibility, which is why this anthology is available for free downloads online, even though the quality is high and would command monetary worth. Our desire to contribute to the community of Africans—writers and readers—who are engaged with poetry is towards the goal of engendering growth, not making profit. There was an all-round willingness from people to be involved in this anthology, from the poets who contributed poetry to those that contributed blurbs. We received over 400 submissions (apart from the solicited contributions), which started coming in from the very day we made the call for submissions. It had felt bitter-sweet because we needed only about 20 poets from this large number. We were eclectic in deciding who contributed to the anthology. Every poet we solicited either blurb or poetry from was researched. It was an effort, but the Brunel International African Poetry Prize would release their 2018 shortlist and Cheswayo Mphanza and Michelle Angwenyi, both of whom we’d earlier solicited works from, would be there, confirming their quality. This issue includes 33 poems, each by a different poet resident on the continent or in diaspora. Each poem is a testimony speaking in its own right to issues common to most young people of African descent. Whether they are personal or political, affecting a troubled mind characteristic of the psyche of our generation or given to asceticism, in the business of love or indifferent to it, experimental or traditional, each of the poems have in common an attention to poetry as a form of art. We had paid attention to artistic quality in selecting only a few from the submissions we received. The 20.35 Africa team is a five-man group of four Nigerian poets and one visual artist-writer: D. E. Benson, ‘Gbenga Adeoba, Chisom Okafor, Osinachi. Above all external support, publishing this anthology would have been in no way possible without the contribution of these immensely talented teammates. My gratitude goes to Laura Kaminski, who was unreserved with her knowledge in assisting us through the foundational stage of this project. And Wale Owoade, as amicable as he was helpful to the best of his ability. Safia Elhillo and Gbenga Adesina are two beautiful people. Their level of involvement is more appreciated when one thinks about the density of their schedule; to agree to guest-edit this anthology without any benefits shows true supportiveness. It is an honor to have Hope Wabuke, Matthew Shenoda, and Mukoma wa Ngugi say true words about this anthology. I also appreciate the people at Frontier Poetry, Commonwealth Writers Foundation, Praxis Magazine, and Enkare Review for publishing our call for submissions. The editors of Brittle Paper have been welcoming of our idea and work from the day we’d contacted them. We at 20.35 Africa owe them our collective gratitude for trusting our initiative. Contemporary African poetry is not yet where it needs to be, but everything that is happening now—the various institutions that are working for the growth of poetry from young Africans—shows an uplifting from a former place of comatose. We at 20.35 Africa remain devoted to creating yet an extra module of poetic expression for young Africans. 20.35 Africa: An Anthology of Contemporary Poetry is dedicated to the late Ugandan poet Joel Benjamin Ntwatwa, a.k.a. NEVENDER, who passed on early this year.